Sandalwood is a boon for people with problematic skin. It soothes and calms down acne and pimples. Zenziva is a US based skincare brand founded by lovely Andrea (She is an amazing girl!) that focuses on creating Hawaiian inspired and plant based natural skincare products for its customers. 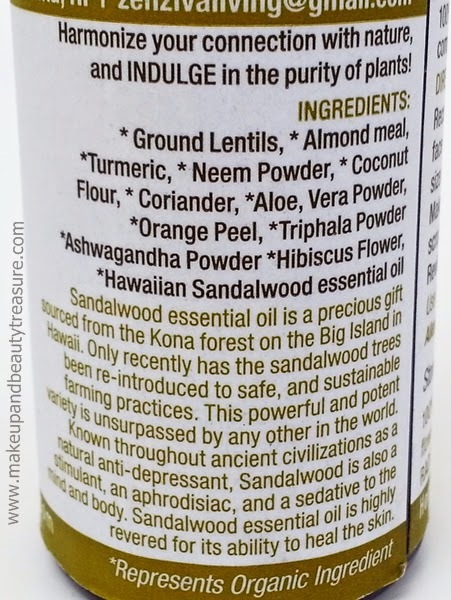 Today I am going to review Zenziva Hawaiian Sandalwood Cleanser/Exfoliant that is the most effective cleanser or scrub I have tried. 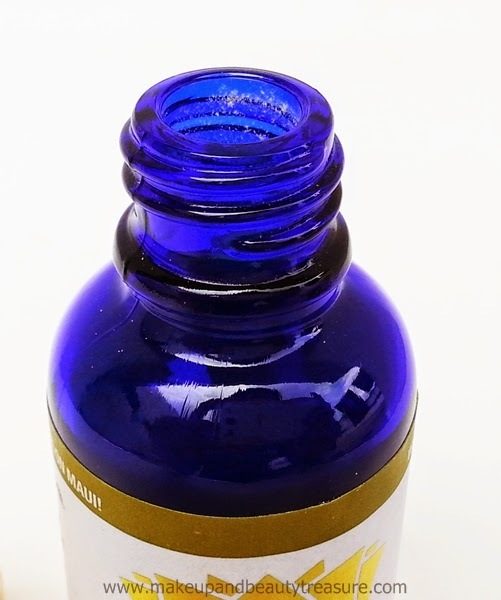 Zenziva Hawaiian Sandalwood Cleanser/Exfoliant comes in a sturdy, dark cobalt blue glass bottle with a golden screw off lid. The dark glass bottle preserves the aromatic and therapeutic properties of essential oil from sunlight. The product is filled to the brim and can be easily dispensed through a medium sized hole without any mess. The packaging is really light and can be easily carried around in a bag. The cleanser or scrub is light yellow in color and has a mild smell of lentils and flour. The cleanser is in powder form and feels very soft. 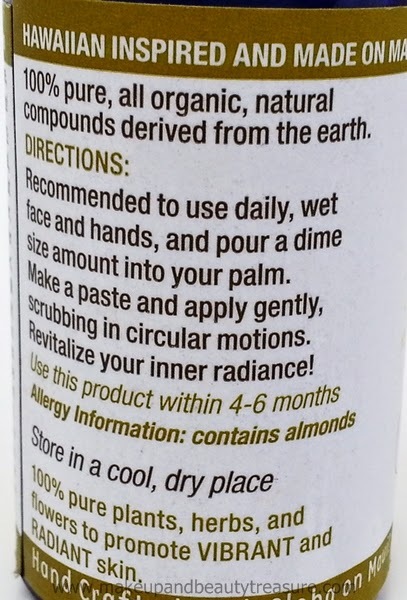 I simply take a coin sized amount of cleanser on my wet palms, pour little water on it to make paste, rub together and massage it lightly onto my wet face. 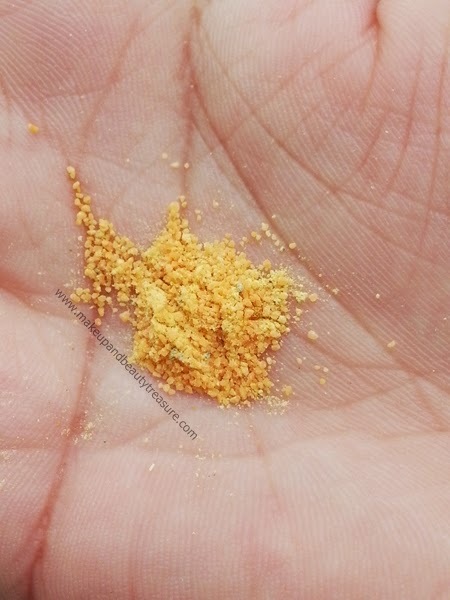 The powder feels soft and gentle on my skin just like turmeric and besan mixture my mom used to make for me. It has very fine granules that do gentle exfoliation. I massage it with gentle hands as I use it daily. I then rinse it off with cold water, towel dry and follow it up with Zenziva Moisturizing Serum (Review coming soon!). The powder does not create any lather and feels just like a homemade powder. My skin feels soft, smooth, clean and bright. The powder thoroughly cleanses my oily skin and gives a healthy radiant look to it. It does not aggravate pimples and acne and lightens blemishes. It is easily rinsed away and does not leave any residue or stain behind. I use it every night to remove my makeup. Yes it removes waterproof makeup too very effectively (Super impressive!). It removes every speck of makeup without drying out my skin. The scent does not linger and vanishes as soon as the powder is rinsed away. It cleanses and brightens up my skin really well. I did not go for any facials in my cousin’s anniversary party due to few acne on my cheeks but with the regular usage of cleanser my skin looked really clean and bright. It does not dry out my skin and I do not feel the immediate urge to moisturize my skin. It instantly polishes my skin without breaking it out. It would suit all skin types as it is 100% natural and preservative free. I usually use at night and follow it up with Zenziva Moisturizing Serum which is extremely light. Andrea is such a sweetheart and talented girl. I told her my issues regarding my cystic acne and she told a miraculous recipe that is really working in combating and clearing my acne. Take 2 asprins and dissolve them in lemon juice. In India asprin comes under the name disprin and is available at all medical stores. Asprin dissolves really quickly. Pour Zenziva Hawaiian Sandalwood Cleanser/Exfoliant to make paste and apply it as a mask. As I have only one or two acne, I use it as a spot treatment. You must use it twice daily to get visible results. I have been using it for more than two weeks and I could see it lightens up my blemishes and combats the acne too. It has become my HG face mask to treat my acne. 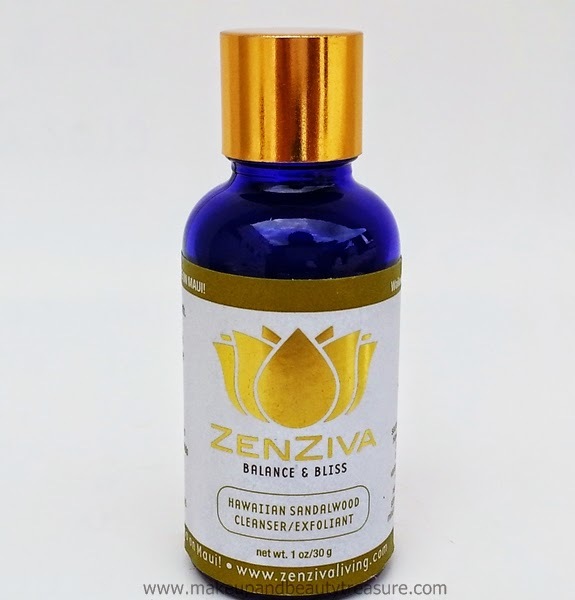 Zenziva Hawaiian Sandalwood Cleanser/Exfoliant contains certified organic and natural ingredients like ground lentils, neem powder, turmeric, orange powder that are a boon for acne prone or problematic skin. It is also great if you have dry and dull skin. It is suitable for all skin types and I have not faced any adverse effects whilst using it. • Feels gentle on the skin. • It can be used as both cleanser and scrub. • Removes all dirt, oil and dead cells off the skin. • Removes even waterproof makeup effectively. • Makes my skin clean, smooth and radiant. • Does not leave stain behind. • Works like a charm on cystic acne when used as a mask with asprin. It combats acne and lightens blemishes. • Pricey but I am so happy that it works! I really need to stock it! Zenziva Hawaiian Sandalwood Cleanser/Exfoliant is the best natural cleanser/ scrub or mask I have ever used. It works like a charm on my acne prone skin making it smooth, clean, bright and clear. It removes all makeup and dead skin cells making it look healthy and beautiful. I love using it as a mask on my acne. It lightens up my blemishes with regular usage. I would highly recommend it to anyone and everyone! I really want to thank Andrea for creating such a miraculous product! It is indeed a magic potion from Maui! 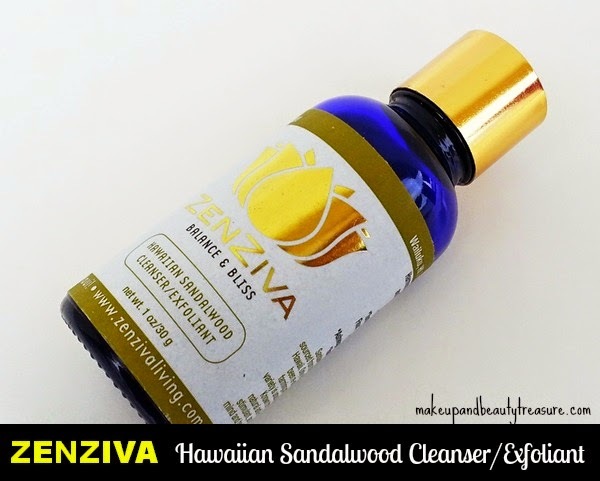 Have you tried Zenziva Hawaiian Sandalwood Cleanser/Exfoliant? How was your experience? Share in the comments section below! I am using the Forest Essentials pack as powder cleanser and they are working quite nicely! i really need to try FE soon! Looks like you are totally in love with this Megha.. Its good but too pricey.. This sounds like a great product.. This is not at all messy Fio and makes skin super clean and healthy! I am totally in love with it!